The rise of various types of flooring material had for a while pushed concrete to the background. 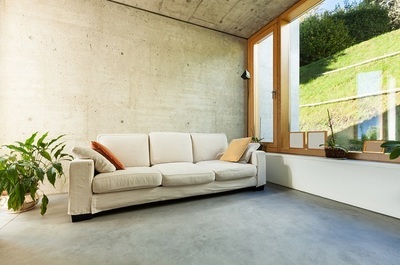 Largely used in industrial and commercial environments, concrete is finding its way back into homes. Generally, people prefer parquet or wood flooring, stone and vitreous tiles. Each has its advantages. Parquet or wood floor creates a nice warm ambience and it also deadens sound if it has cork backing. Stone is hard wearing and the natural striations confer unique aesthetic looks. Vitreous tiles can look quite contemporary but there is a uniform look to all these floors. Enter the versatile concrete floor. You can use your imagination to create concrete floors with distinctive looks. There are quite a few advantages to using polished concrete floors for your homes. You can now pick from a variety of flooring types such as acid stained, concrete with microtopping, radiant floors, painted concrete or inlaid. Polished concrete tops in the looks, performance and durability as well. Polished concrete differs from the usual concrete in that it is compounded using a chemical densifier and the surface is ground and polished after the concrete sets to create a smooth, uniform finish. The final finish depends on the grinding process and the grit size used to impart a glossy look or a satiny look. One can also achieve the polished look by using acrylic, epoxy or polyurethane finishes. You will realize that using the chemical sealants make it easier and quicker to achieve the polished look besides imparting measure of protection to the floor. However, before applying the surface lacquer, the concrete does require grinding and polishing to some extent. Since concrete can be stained prior to laying, designers and home owners can achieve a precise match with walls and furnishing. Concrete is the new chic for homes. It does entail work to achieve the required polish but once in place, it will stay fresh for years with minimal maintenance. It takes some time to lay the concrete and then grind and polish it to the desired level and then follow up with the topcoat of acrylic, epoxy or polyurethane lacquer, but once put in place it will last for a long, long time. This is one of the chief advantages of polished concrete floor for homes. The other benefit that homeowners appreciate is its affordability, even after the work of grinding and polishing, in comparison to other materials. It may cost the same as granite or vitreous but the maintenance costs are low, which makes polished concrete so much better in terms of cost benefits. Cleaning concrete floors is easy. All that you need is soap and water and a mop. One of the best advantages homeowners will appreciate is that one can achieve precisely the look that one desires. You can have a plain concrete floor, a mosaic floor or even create interesting designs and patters with the use of colored and stained concrete. Even if you lay out a plain floor, you can always enhance it with rugs. Leave it as it is if you are allergic to carpets and dust and the floor will look immaculately beautiful. When you use concrete for flooring you are contributing towards a sustainable environment. Polished concrete allows a high degree of customization in terms of colors, designs and finishes. You may be tempted to lay out the concrete floor or, if it is in place, give it a polished look by grinding and lacquering it. The effect will be simply marvelous. However, this is best left to professionals who have experience in polishing concrete floors for homes.